This is my send-off to Dexter. As the manager of what was the #2 Dexter fan-site (#1 before this :)), I have an eccentric history with the series. Frankly, this is the series that changed my life. Even if it dropped off in quality after season four, it still served as an inspiration to me and that matters. The inspiration to do what exactly? Become a television producer. I had known that I wanted to be involved in some of creative writing and Dexter was one of the shows to showcase cable TV as being by far the best format for that. The cast and crew should be most proud of that: the show's transcending ability to be an inspiration thanks to the quality they were able to pull off for much of its run. Yet, they also have the first four seasons to be proud of. That was grade-A, euphorically-good television. 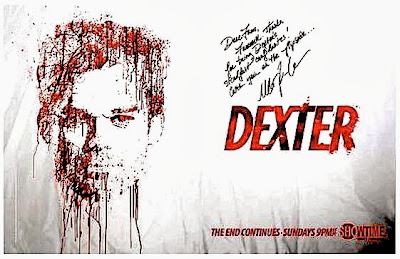 Whether Dexter was on too long can be argued, but we are grateful for the latter four even if they don't compare. I think we can all agree we'd be more grateful if this final season was amazing but alas. The show will just have to be remembered for being partly great while also kicking off and reinvigorating the careers of every actor it's had on. If the series ended after five seasons with an amazing ending, we would be complaining that it wasn't on long enough so there was definitely a trade-off here. Dexter was a community. Surprisingly, it seemed to be 60% female! But it was one of the most passionate groups ever, which made us more amazed by good episodes and more disappointed by the lacking episodes. But we stuck around till the end, and now a proper goodbye would be a wholly-amazing finale. In fact, if Dexter survives the finale and it's not as amazing as it should be... I have plans that could work to get us a better series ending. But this post is about saying goodbye, for now. So goodbye to a series that was more than television. It was a part of our lives; one that we could debate about any day of the year. At its finest, it was symbolic and so multi-dimensional it shined. At its worst, the show became a great cast following a more archaic formula. Nonetheless, it will be remembered as more than the first four seasons. It will be remembered as the some of the most important 96 hours of any fan's life. I couldn't say; perhaps with my fan-site and creative ambitions I was most affected by the series. Although, I'm sure there are bigger fans out there. This is a show that warrants that. Dexter is a part of every fan, and not many other shows can claim that. We'll miss the series, but it's time to move on if it ends in as potent an ending as it deserves. Goodbye, Dexter Morgan.